Today is a very sad day for me and I know for quite a few others also. 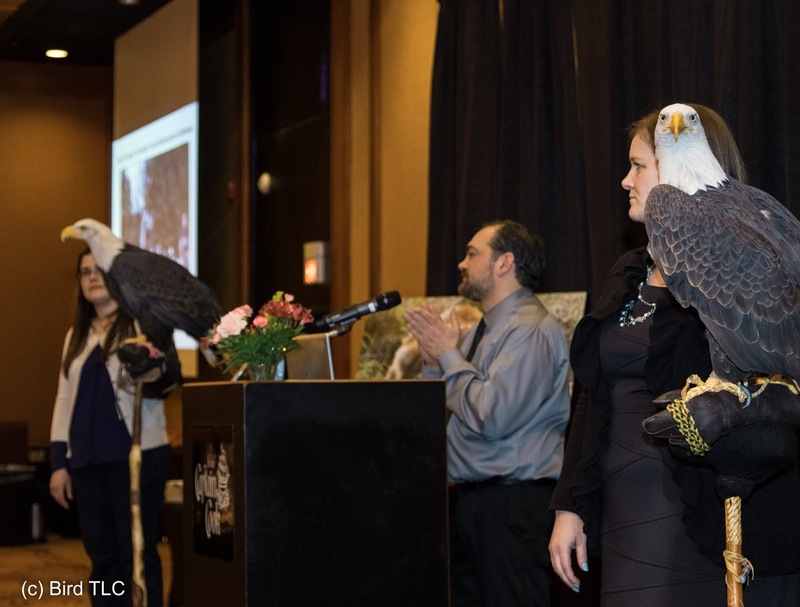 This morning (Sunday) I got a call from Guy Runco, Executive Director of Bird TLC, telling me that Hal had passed away. I was in such shock I didn’t know how to respond. I spent the rest of the day vegging in front of the TV and eating all the junk food in the house. This has hit many of us hard. How do you talk about an eagle that was special? He even made me feel special. He could no longer take care of himself in the wild due to no fault of his own. But, he was independent. He knew what he liked and told you what he didn’t like. He still captured magpies that strayed into his mew. 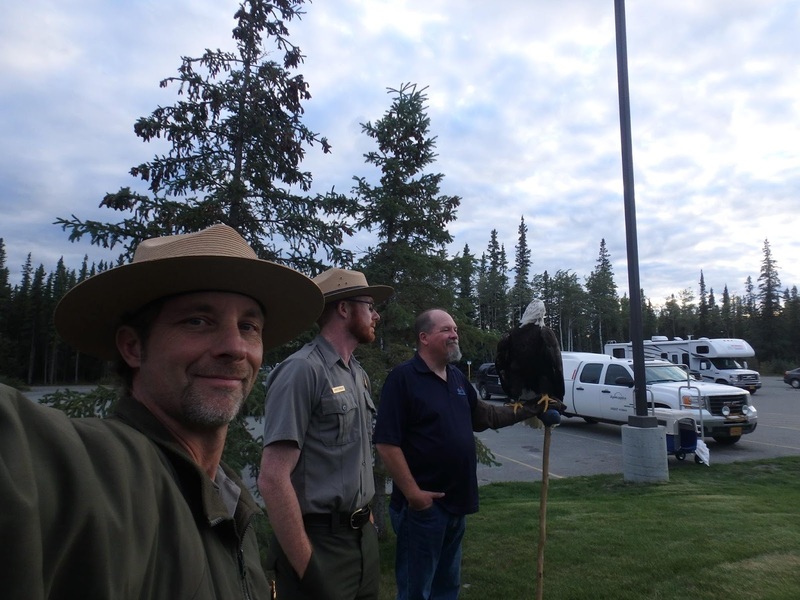 Hal was hatched in the Russian Harbor area of the Kodiak National Wildlife Refuge during the blackest days of recent Alaska History. The Exxon Valdez ran aground on Bligh Reef on March 24, 1989 spilling 10.8 million gallons of Alaska crude oil into Prince William Sound creating the most devastating human-caused environmental disaster. Hal was found on August 20, 1989 on the beech of Russian Harbor. He was thought to be about four months old. He had light oil on his breast and tail. 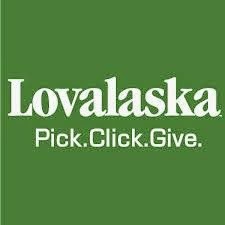 He was picked up by the cleanup crew and processed through the Seward Bird Rescue Center. He was transferred to Bird TLC soon after. X-rays showed a fractured left wing at the shoulder which was non-repairable. After two months he began training to become Bird TLC’s first education eagle. Hal has had 6 presenters over the years and has lived at 2 caretakers homes. He also spent some time living at the old clinic on Nielson Way and the current one on King Street. 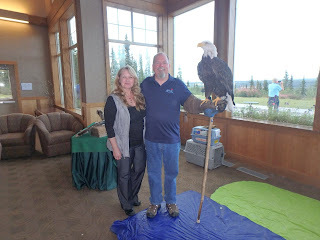 He has traveled all over Alaska doing education presentations for Bird TLC. With me, he has traveled to Seward, Fox Island, Soldotna, Sterling, Telketna, Tok, Wrangell – St Elias NP, Copper Center, Kodiak NWR and many other places. 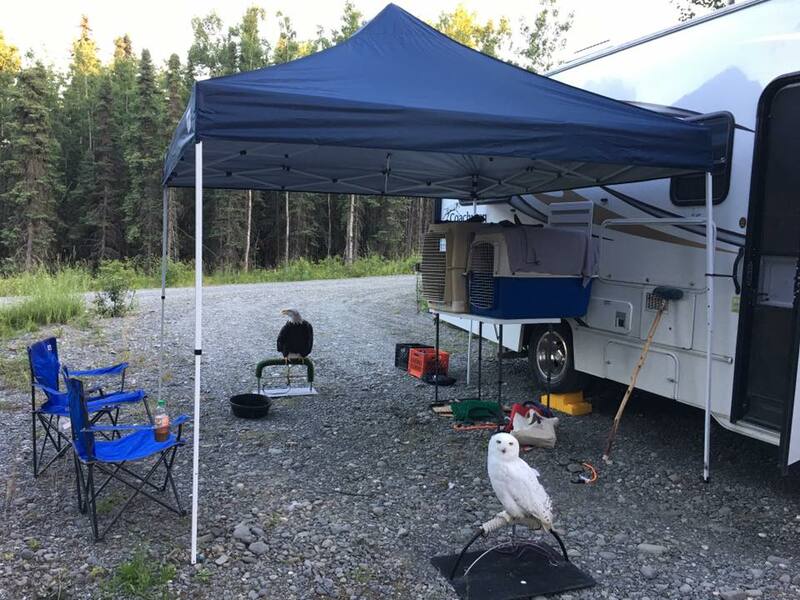 We’ve stayed in hotels, private homes, wilderness lodges and he has camped in my RV. Hal was a well-traveled eagle. 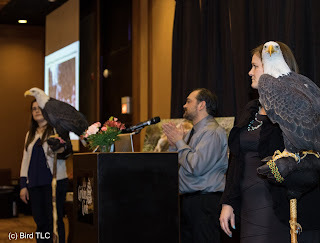 We did presentations at Boy Scout Eagle Award Ceremonies for the scouts that had done so much for Bird TLC. We also did military retirement ceremonies for those that defended our freedom. Hal was cared for at Guy Runco’s home. Besides myself, he was also presented by Patricia Garcia and Terri Johnson. In years past he was presented by Heather Merewood, Cindy Palmatier and Kerry Seifort. 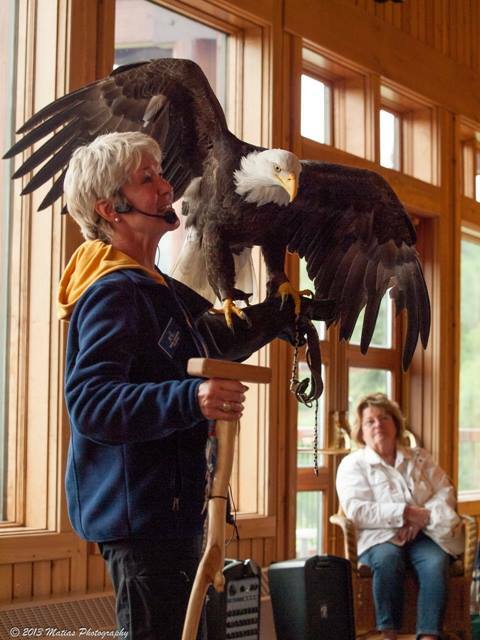 We all loved Hal, and so did the rest of Bird TLC. Hal did education presentation for thousands of people. . He enjoyed being in front of an audience. 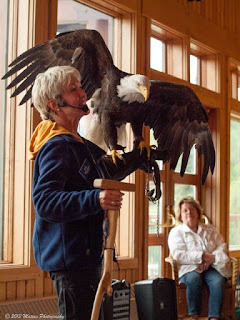 I’d talk about him, other eagles and what’s really cool about them and about Bird TLC. We would do a presentation at Mt. McKinley Princess Wilderness Lodge and people would line up for an hour afterwards to have their picture taken with him. Hal always had the look “Come admire me. I’ll give you my regal eagle pose”. As Chris Maack says “He was our ed icon”. Nothing impedes his free flight to the heavens now. Thanks for the memories. I’m sure going to miss you my feathered friend. 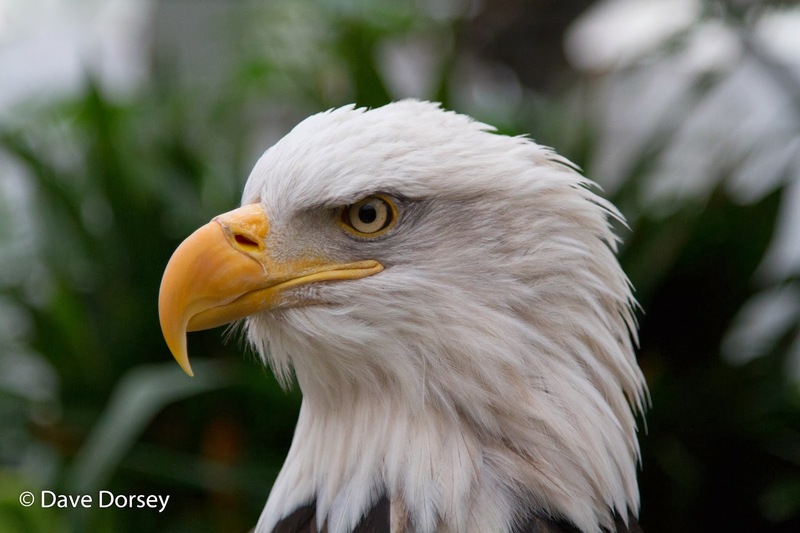 I’ll never look at another eagle without thinking of you. Say “Hi” to Dr. Scott, One Wing and Ol’ Witch. Beautifully put, Dave. Thank you for this.